ArtScapades presents Art that Defines America which covers art from the founding of America to the early decades of the 20th Century. Lectures below can be used in a series, individually, or customized to fit your needs. In each lecture, ArtScapades places the artists in context with an abbreviated timeline of art history. In Colonial Portraiture, ArtScapades gives the background of the development of portraiture in America, including information on artists in the military, the rise of the middle class and the importance of art to document history. In Artists Abroad, ArtScapades looks at American artists who, despite their expatriate status, are among America’s greatest talents. In American Vistas and American Images, ArtScapades explains the changes in art brought about by national pride, the westward expansion, and the growth of travel. In Modern American Beginnings, ArtScapades explores how a modern movement developed in America led by artists of The Ashcan School and The Eight. In The American Scene, ArtScapades details how artists included realism in their works, and looks at how FDR’s New Deal affected the art world. In Colonial Portraiture, ArtScapades chronicles the life of four artists and their works, John Singleton Copley, Charles Willson Peale, Gilbert Stuart, and John Trumbull. In Artists Abroad, ArtScapades focuses on the works of Mary Cassatt, John Singer Sargent, and James McNeill Whistler. 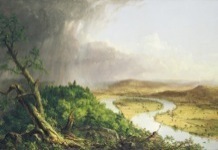 In American Vistas, ArtScapades presents three Hudson River School artists, Thomas Cole, Frederic Edwin Church and Asher B. Durand. In American Images, ArtScapades looks at the art of Albert Bierstadt, Thomas Eakins, and Winslow Homer. In Modern American Beginnings, ArtScapades explores George Bellows, Robert Henri, William Glackens, John Sloan, and Edward Hopper. In The American Scene, ArtScapades presents artists that include Thomas Hart Benton, Grant Wood, John Steuart Curry, and Andrew Wyeth. Approximately fifteen works per artist are discussed including iconic works plus those that illustrate significant trends and events in their lives and careers.